Whether your event is a wedding reception, a corporate party, What Danny Ray does is almost always the same. He seeks to make a connection with EVERYONE there. Most often, that “connection” means getting everyone on a dance floor and keeping the groove so tight that no one wants to leave! At an intimate 70-guest dinner they might play some classic Sinatra and The Beatles mixed in with acoustic versions of Ed Sheeran and The Lumineers. As a 6-12-piece band at a wedding reception, Danny might keep the party jumping with some Earth, Wind, & Fire, Walk the Moon, Bruno Mars, and some fun dance mashups. 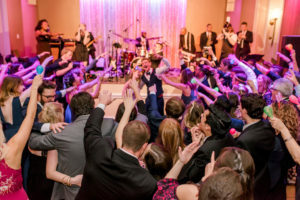 At a 400-person corporate event, the band may rely on our read of the room and mix in song choices over the past 50 years while inviting everyone into the party. Formed from the philosophy that every event is unique, Danny Ray and the Acoustic Production aims to be the perfect band for EVERY moment of your event. For cocktail hour, their unique acoustic arrangements, jazz, and light pop music invites everyone into the event. Once the cocktail/dinner hour ends, they transition to a no-holds, non-stop, high-energy dance sets. Danny Ray’s goal is that everyone becomes a part of a event that is exhaustingly fun and uniquely yours! Wedding Trends 2018 Highlight Reel from DANNY RAY on Vimeo. "The Way You Look Tonight" performed by DANNY RAY and the ACOUSTIC PRODUCTION from DANNY RAY on Vimeo.